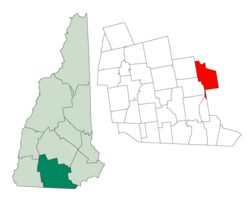 Manchester is the largest city in New Hampshire. It is in Hillsborough County. The 2010 US Census says that 109,565 people live there. However, an estimate done in 2014 puts the population at 110,448. ↑ "2007 Population Estimates of New Hampshire Cities and Towns" (PDF). NH Office of Energy and Planning. June 2008. Retrieved 2008-06-03. This page was last changed on 12 February 2019, at 09:44.